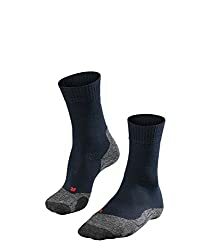 Socks are among the most underrated pieces of hiking clothing – hikers often spend a lot of money on sophisticated outer layers, mid-layers etc. but when it comes to socks, they somehow become penny pinching. We, however, think that socks are very important as they are worn directly against the skin on your feet (which are doing most of the work when hiking) and thus have big impact on your comfort. High-quality hiking socks keep your feet warm, dry and blister-free. In this review we selected the best winter hiking socks currently available in order to make your buying decision easier. We only listed hiking socks that are known for their great performance. 1. 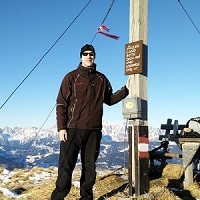 Buying Winter Hiking Socks – What is important? Hiking socks should not only be breathable and moisture-wicking but should also provide great temperature regulation. Your feet shouldn’t be too warm or too cold. If your feet are too warm, they will get sweaty and moist skin is more prone to blisters. On the other hand, you will definitely not have a pleasant hiking experience if your feet are too cold. The temperature regulation, breathability and moisture-wicking performance of a pair of socks depend on the quality of the fabric. 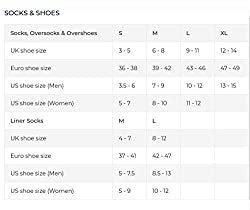 Socks are usually made of synthetic materials (nylon, elastane), blends of natural and synthetic materials (Merino wool and nylon) or purely natural materials (cotton). Socks made of synthetic materials are known for absorbing very little moisture and thus dry a lot faster than other socks (cotton, Merino wool). The main downside of synthetic socks is that they offer poor antimicrobial performance – they quickly become smelly. 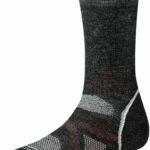 When it comes to socks, Merino wool is always mixed with nylon or other synthetic fabrics as Merino wool itself is not strong enough to withstand the constant abrasion against the inside of your footwear. Socks that contain a high percentage of Merino wool are known for being very breathable and for having a great moisture-wicking performance. In addition to that, they also retain warmth even when wet – unlike socks in other materials. For more information about Merino wool, check out Why you should wear Merino wool clothing. Socks made of cotton are not suitable for hiking (or any other sport activity) as they absorb too much moisture and thus tend to cause blisters and conductive heat loss – for more information check out Why is cotton bad for hiking. Hiking socks should withstand regular washing without changing their shape and performance. 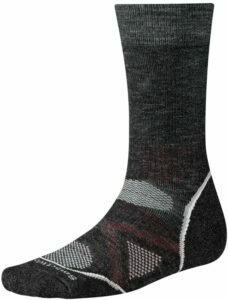 The Smartwool PhD Outdoor Medium Crew socks are very comfortable and perfect for use in winter. However, as they offer great temperature regulation they can also be used in other seasons. The socks are made of a blend of Merino wool, nylon and elastane and therefore offer great breathability, moisture-wicking properties and anti-odor performance. The breathability is additionally enhanced with strategically placed mesh ventilation zones. They feature the 4 Degree Elite Fit System which ensures great stretch and recovery performance. The durability of the socks is increased with ReliaWool which is included on high impact areas. 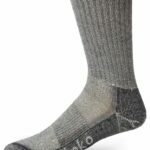 The Smartwool PhD Outdoor Medium Crew socks are perfect for hikers and mountaineers who want to keep their feet comfortable on physically demanding adventures. The SealSkinz Trekking Thick Mid socks differ from other socks in this review by being waterproof. You may ask yourself why you need waterproof socks. The answer is that at some point even the best waterproof boots leak and therefore it is good to have a backup. 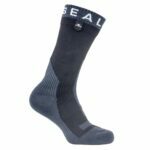 The SealSkinz Trekking Thick Mid socks are made of 3 layers; an abrasion-resistant synthetic outer layer, a hydrophilic membrane and a comfortable inner layer made of antimicrobial Merino wool. The hydrophilic membrane is very thin and flexible and thus does not cause any discomfort while efficiently protecting your feet against water and wind. The socks have elastic ankles for better fit. 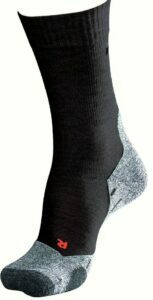 The SealSkinz Trekking Thick Mid socks are best for those who often hike in wet and cold conditions. The Falke TK2 socks are a little thinner than the socks from SealSkinz and SmartWool, but combined with the right footwear they provide enough warmth for winter hiking. As they are made out of synthetic materials only, they dry very fast and absorb very little moisture. For increased comfort, the socks have cushioned footbeds and toe cushioning. In addition to that, they are equipped with elastic ankles for better fit. 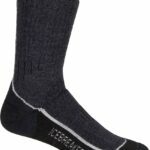 The Falke TK2 socks are best for those who want a pair of relatively inexpensive socks for hiking, mountaineering or any other outdoor activity. 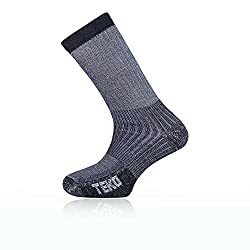 The Teko M3rino XC Midweight socks are made of a blend of Merino wool and synthetic materials for increased durability. As the percentage of Merino wool in the blend is relatively high, the socks provide great temperature regulation as well as moisture-wicking performance. The merino wool that is used in these socks is completely organic and chlorine-free. The socks have a ribbed construction and seamless toe for better comfort and fit. The footbed is additionally reinforced in order to provide good durability. 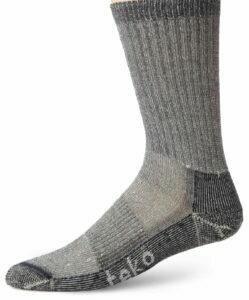 The Teko M3rino XC Midweight Hiking socks are a great choice for basically every outdoorsman. 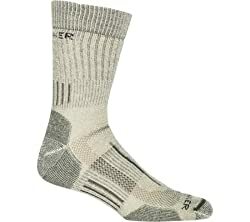 The Icebreaker Hike Heavy Crew socks have a high content of Merino wool fibers and are thus very comfortable. They are breathable and moisture-wicking. In addition to that, they also excel at temperature regulation. 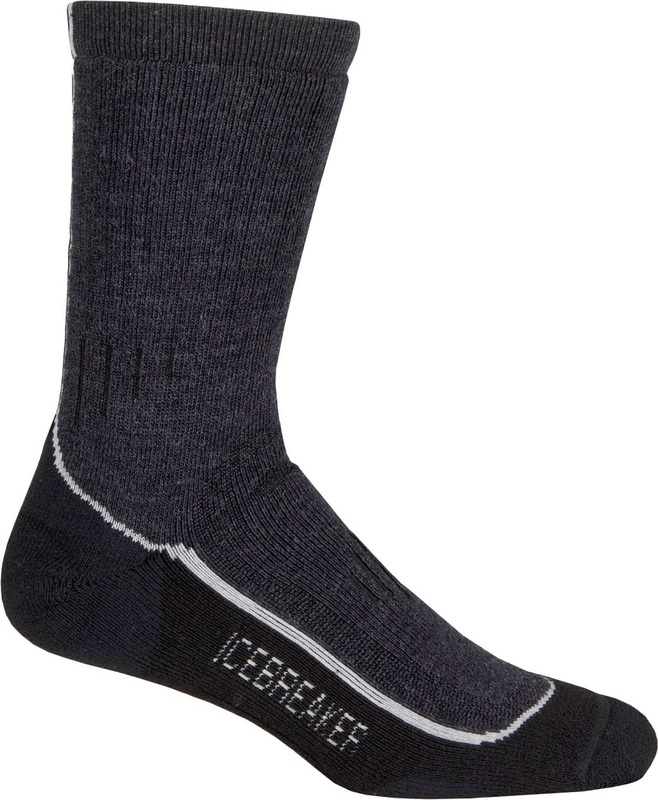 The Icebreaker socks are equipped with stretch panels in ankle area and feature anatomical fit. As the Icebreaker Hike Heavy Crew socks provide superb comfort and odor-control, they are best for those who often do long and demanding hiking trips. What kind of socks to wear in winter? We recommend wearing socks made either of synthetic materials (polyester, nylon etc.) or Merino socks. These materials are moisture-wicking and quick-drying. Note that wet socks make your feet cold very fast since the thermal conductivity of water is much higher than the thermal conductivity of air. You should thus avoid cotton socks in winter because cotton socks dry slowly and absorb a lot of moisture. What is the warmest sock material? The warmth of socks depends more on the thickness of fabric than on the actual material. However, the material should be moisture-wicking and quick-drying as wet socks make you feet cold rapidly.